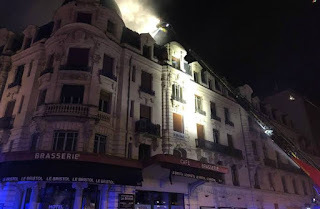 Toulouse:: Twenty-two people were injured, two seriously, when a fire swept through an apartment building in the southwestern French city of Toulouse, the fire service told AFP on Thursday. Part of the four-storey building collapsed and guests from a neighbouring hotel were also evacuated, said fire lieutenant-colonel Sylvain Gergaud. "The fire spread very quickly through the lift shift," he said. Two firemen were among the casualties. The blaze had been brought under control by daybreak.